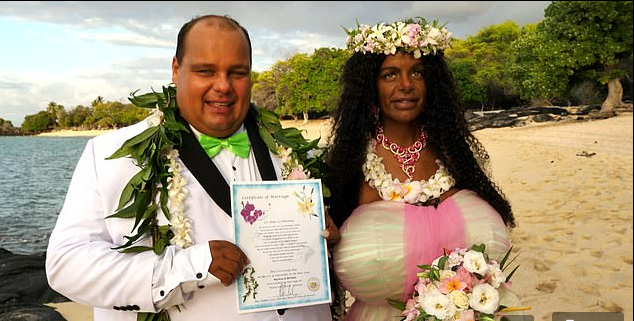 A glamour model who hit the spotlight after dramatically changing her skin colour through tanning injections has married in Hawaii. Martina Big, 30, from Germany, is famous for her body modifications – including 32S B.reast implants that she had boosted even further in time for her wedding. 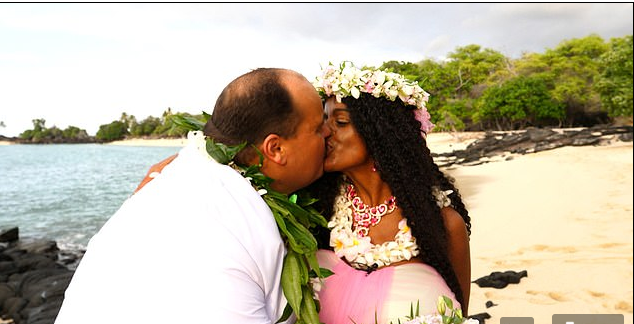 Martina married her fiance, named only as Michael, 31, on an idyllic beach on ‘Big Island’, as the main island in the US state of Hawaii is known. The model, who also had extra lip fillers before her big day, has splurged more than £50,000 on plastic surgery, and claims to have the biggest B.reasts in Europe. She’s also had radical tanning injections, a nose job, liposuction, and had lip fillers – all to achieve her goal of becoming an ‘African woman’. Her B.reasts now weigh an astonishing 7.5 kilogrammes (16.5 lbs) each, but the model said she did not mind a little extra discomfort to feel more attractive for her big day. For their big day the couple took a 26-hour flight from Germany to Hawaii, which followed stag and hen parties held in a field near the city of Bremen in north-western Germany. However the wedding itself was a more low key affair, involving just the happy couple and their wedding planner who they named only as Stefan. Martina says one of the big challenges she faced was finding a wedding dress to fit her unique body, at first trying on a yellow maxi dress and then a more traditional white gown. However in the end she settled on a custom-made strapless white dress with pink mesh paneling which barely contained her very ample assets.